21 Clapham Old Boys wanted to play. Alas we could only select 14 but a great sign of appetite for vets football at Clapham. The prize for the first round vets cup win was a trip to Nottsborough FC. A club formed of Nottingham and Loughborough Universities’ finest and their formidable form did not put off 21 Clapham Old Boys from asking to play. 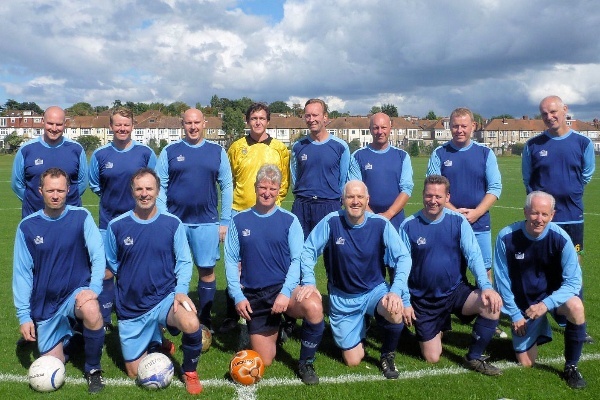 Alas we could only select 14 but a great sign of appetite for vets football at Clapham. With John McGowan skipper for the day, Clapham were soon under pressure by a fluid, fit footballing side. Spencer McGuire in goal was kept busy however the first real chance came at the other end. The referee gave a free kick for a heavy foul on Jim McTavish. From the left flank, Luke Roszkowski sent in a teasing cross which had the Nottsborough keeper and defence beaten, unfortunately it also beat the Clapham players attacking it and went across the face of the goal untouched. Within a minute Nottsborough took the lead and threatened to extend it immediately. Then Clapham began to keep possession better and play in their half more. After an extended period of pressure Clapham were equal – Paul Hamilton meeting a corner with a powerful header, too strong for the keeper and man guarding the post. Level at half time we talked about keeping it tight and trying to nick a goal…but extra time was to be avoided at all costs! Chances at both ends, this despite Clapham’s back four marshalled by Dave Halpenny and Andy Brannon showing all the hallmarks of George Graham’s Arsenal with a water tight offside trap (that had never been discussed or practiced prior to the game). Then Nottsborough took the lead again with a fine strike from outside the box. More pressure from Clapham, particularly dangerous from set pieces. Hammy went close again, as did Errol McCarthy. The game ended with Clapham heaping more pressure on Nottsborough, who knew they’d been in a game. Lots to work on – particularly when in possession. But another great outing for Clapham’s vets side when you consider Nottsborough pedigree, resources and far busier schedule.